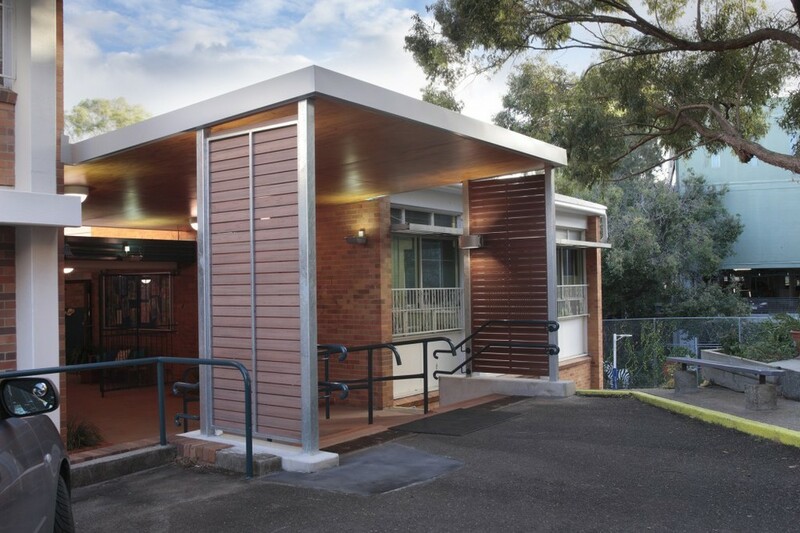 The Multipurpose Hall and Classroom extension was funded by the BER Programme through Brisbane Catholic Education. The client requested an iconic building to provide a much-needed covered outdoor area for sporting activities and arts-based events. The building was erected on the site of the existing double tennis courts and is equipped with a full-sized tennis court and handball courts, a stage and off stage areas, a multipurpose kitchen area, storage, amenities and AV facilities. 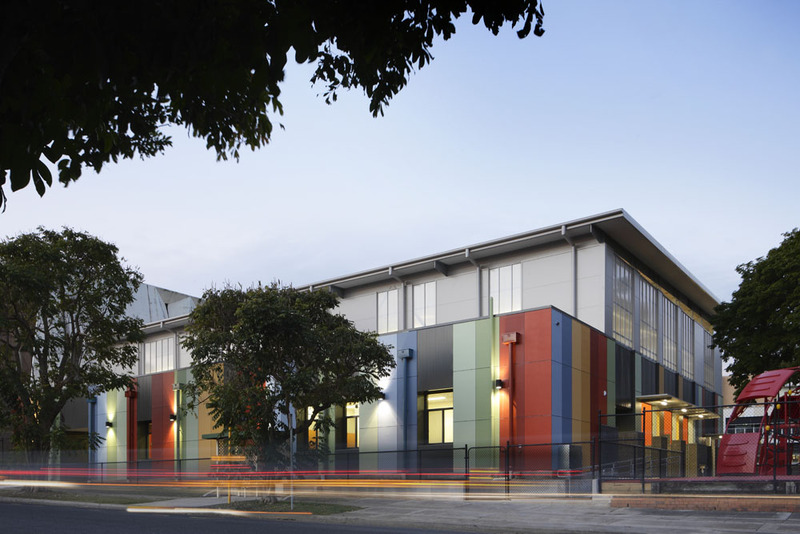 The brightly striped façade responds to the vibrancy of the adjacent play equipment and gives the school a presence at street level. Respect is paid to the Holy Family Church on the same site, through the use of neutral colours at higher levels. The project received a Commendation in the Brisbane Architecture Awards 2013. The project was Finalist in the Dulux Colour Awards 2012. Ferrier Baudet architects worked with Lincoln Austin on this artwork at the entry of St Leo’s College. The artwork is entitled “Correlate”. This project’s success lies in the seamless integration of client, architect, artist, specialist sub-contractors and builder to bring to fruition a modest work that reveals meaning and depth in a timeless way. The original structure was retained and enhanced and the art work integrated as a part of the architecture. Correlate suggests something that shares mutual or complimentary properties. The symbolism expressed in the artwork will live on and will be subject to differing interpretations over time. It will become a distinguishing feature of St Leo’s College and the University. Importantly the modest architecture of the original building was retained, enhanced functionally and the art work specifically designed to sit harmoniously in the original building. The wall is a series of triangles, some in clear glass and some in mirrored glass, creating a view to the university and reflection of the college, as in the artist’s words, “In any balanced relationship, a degree of reflection is required. From the outside the mirrors reflect the university grounds while the clear glass will allow a view into the college creating a simultaneous view of both institutions”. St Leo’s were successful in securing an Arts Queensland grant for this project. The awning was original but it was both restored and extended to provide vehicular cover. St Finbarr’s school was divided into three areas- a classroom and admin block, a hall with staff room and a preschool on a lower level. 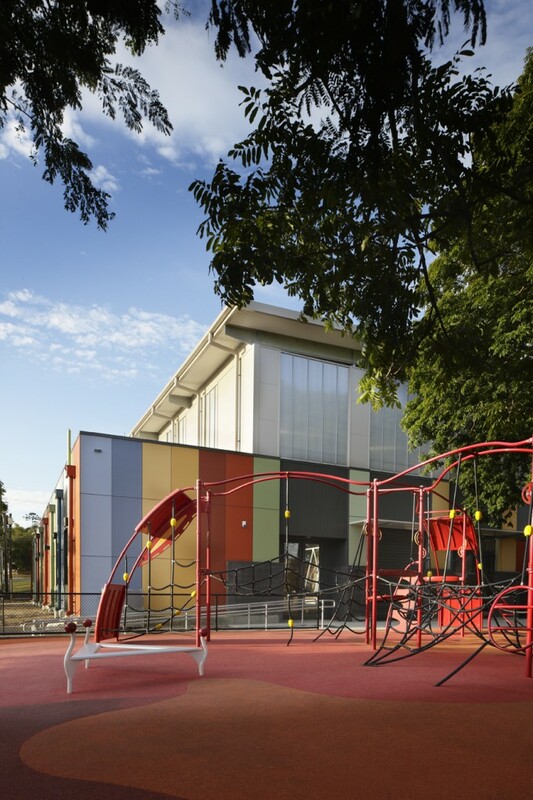 Our solution was to make all areas a cohesive whole by creating better access, building tiered seating to connect the hall to the playground and building a permanent roof structure over the playground that served as a multipurpose space. At Clarendon State School, we were lucky to work both on the small NSP-National School Pride projects and on the bigger P21 building. The principal wanted the covered area to be different from that of the other schools in the Lockyer Valley. We came up with a curved structure in soft bushland and classic cream colours, equipped with a movable stage and night lighting which really transform this simple shade structure into a multipurpose covered area. ‘Clarendome’ as it is now known has become a gathering place for all to use. This project was a great success and a good example out of the BER programme: it came under budget and we managed to get more work done throughout the school grounds with the remaining funds. 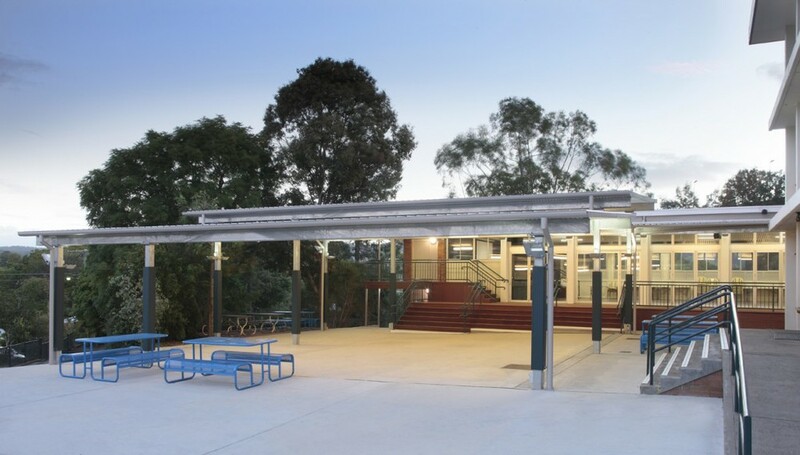 We were commissioned to undertake 25 small school projects, west of Brisbane, as part of the Building Education Revolution. 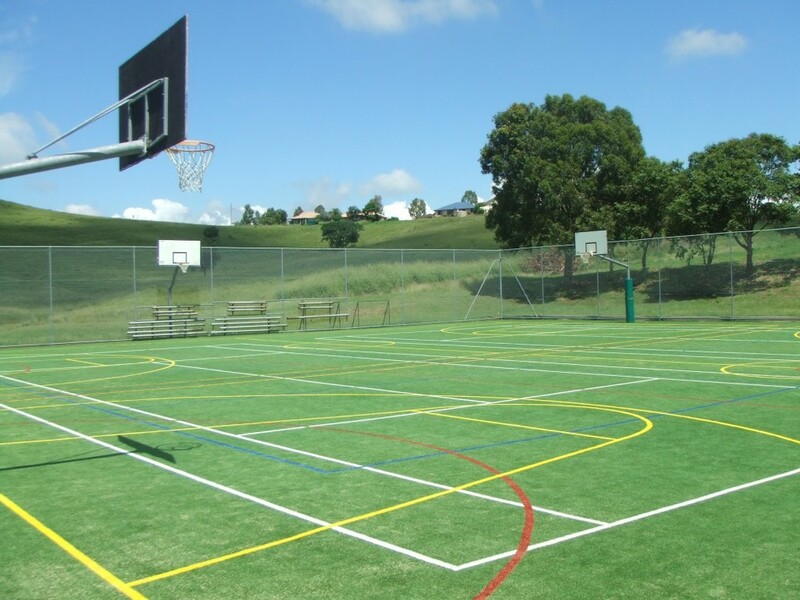 The projects ranged from classroom refurbishments, covered areas and teaching kitchens to sporting facilities. Some of the schools were very small (13 children in total) and some of the buildings had not been touched since they were built a 100 years ago! For us it was an exciting journey of discovery. Each project we worked with the principal of the school and developed a range of options in consultation with the school community. We are proud to report that all of our schools were successful in gaining exceptional value for money.